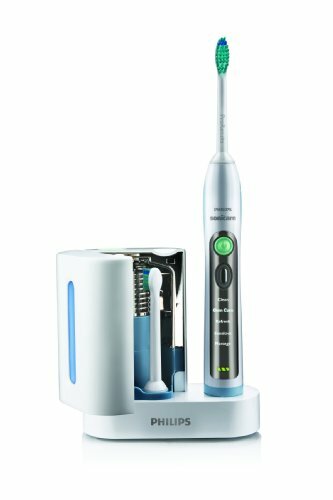 Philips Sonicare FlexCare Plus Sonic Electric Toothbrush, HX6972/10 by Philips Sonicare at In The National Interest. MPN: HX6972/10. Hurry! Limited time offer. Offer valid only while supplies last. With nearly 80% of adults suffering from gum disease, Philips Sonicare, the #1 recommended brand by dental professionals, brings you FlexCare+. With nearly 80% of adults suffering from gum disease, Philips Sonicare, the #1 recommended brand by dental professionals, brings you FlexCare+. Clinically proven to improve gum health in only 2 weeks, FlexCare+ features a unique Gum Care mode, which provides 2 minutes of overall cleaning plus 1 minute to gently clean problem areas and along the gumline, reducing gum inflammation and bleeding, and protecting against gingivitis. Patented Sonic technology drives fluid to stimulate gums, while the contoured brush head removes plaque along the gumline. FlexCare+ also includes a UV Brush Head Sanitizer, which helps you keep select bacteria away from your brush head, and out of your mouth. The sanitizer helps eliminate up to 99 percent of select bacteria and viruses. Includes: 1 Philips Sonicare FlexCare+ toothbrush with 2 ProResults brush heads, 1 UV Brush Head Sanitizer, 1 travel charger, 2 hygienic travel caps, 1 hard travel case. Philips Sonicare HX6972/10 Ships in Retail Packaging. View More In Oral Hygiene & Preventive Care. If you have any questions about this product by Philips Sonicare, contact us by completing and submitting the form below. If you are looking for a specif part number, please include it with your message.